NEW RELEASE! 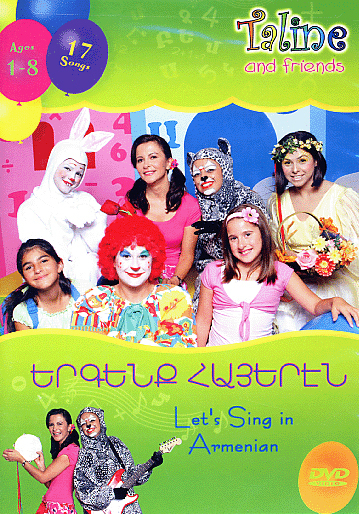 Another amazing DVD by Taline and Friends filled with lots of singing, dancing, games and fun! Meet Taline's newest friend, Shoushanik and join Taline & friends for a trip to the farm where they meet friendly animals and learn about them. The DVD introduces children to the Armenian alphabet and emphasizes the importance of keeping the Armenian language and heritage. This highly educational and entertaining DVD is one your child will certainly enjoy and watch over and over again! Includes 17 New Songs; Parilouys, Jamatsouyts, Aklor Aghpare, Polors Artntsank, Polors Yerkenk, Badik jan Badik, Limbo Rock, Baghbaghag, Ayp-ou-Pen, Titer, Hink Kordigner, Bjlig Mjlig Sarte, Tsyavorner, Ashoun, Hyeren Gerkenk, Tsdesoutyoun, Zankagner.